what game is that based from..
Pokemon. Or, in the native language of some, Pokymanz. 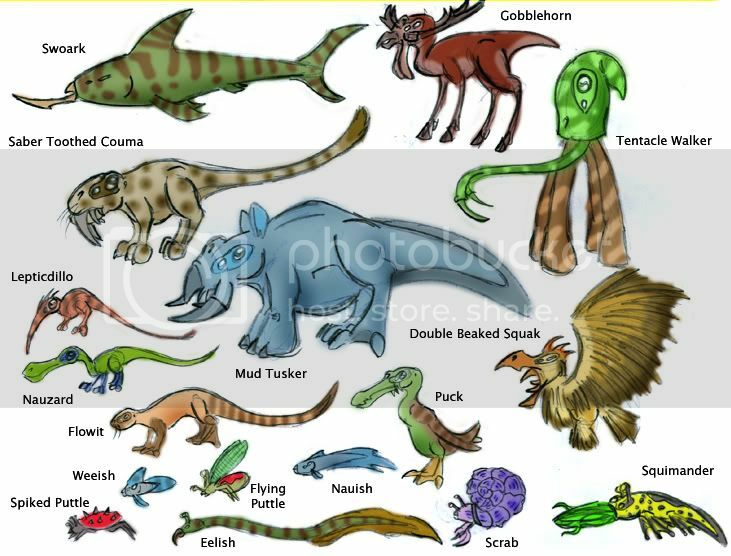 Here are some various animals that live in the River Tribe region. aww but they're all so cute! must learn to genertically enginear these creatures. I continue to be impressed by how you've set up the entire tree of the animal kingdom for the Naucean world. I like how the 'blueprint' for successful creatures is repeated throughout. Just like on Earth! Graduate of the LeRoy Funkified Badass School of Soul. Very neat. The tentacle walker or the swoark are my favourites. The scrab is awesome.. for it's name alone. Too bad it was already used in "Oddworld - Abe's Oddysey" - different creature, same name. If youve been following my Spore-type game on the forum game boards youll have noticed that the Cryoeltans have finally reached the interstellar phase of their civilisation. As such I could use some properly developed aliens for them to interact with. If you dont mind i'd like to have the Cryoeltans encounter the Nauceans, Kazea and any other creature thats original and cool. If you dont mind, PM me with some instructions or plausible stroylines, I dont want to write something that conflicts with your own conceptions of how your creations should act. Well i have not been following any of those games. And i will have to think about the Nauceans, only becuse i would have to catch up. Perosanly i don't really like those kinds of games. I perfer this sorrta story telling with pictures and a description. Perhaps if you convered your Cryoelthans to a post with pictures on here i would be more egar to have contact like i did for the Nauceans and the Kazea. Ok i coppied all the "description posts" only from that thread and pasted it into MS word to read. The thread has only 26 pages but man at 12 font only it comes out to 30 pages of pure text of just decriptions (not discussions or choices). I have alot of reading ahead of me and would really like a short summary. you should read the percusa one on gamefaqs, unfortunately the dumb maint thing on those forums means that older posts are soon deleted so the previous parts are long gone.